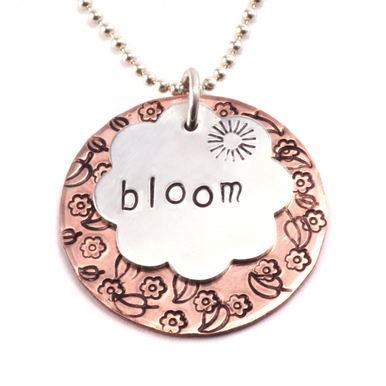 This necklace is perfect for those who want to show off their family, friends, or just favorite words. We love how you can keep adding to it without changing the design. It looks great on any number of blanks, in any font and we especially love how you can add little design stamps to give each name or word some personality. *DESIGN TIP* - make sure to punch the holes higher than the center point to have the necklace hang just right without the blanks flipping over. Fretz Chasing Hammer - $57.00 - We used the balled side to texture the edges of the circle blanks. Sterling Silver 3.8mm x 6.2mm I.D. 16 Gauge Oval J.R., pk of 10 - $4.13 - We picked jump rings that looked similar to the chain.